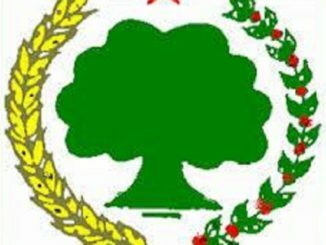 The Human Rights League of the Horn of Africa (HRLHA) strongly condemns the TPLF/EPRDF Government’s endless manipulations of the justice system to its own political ends, which was once again manifested in the fully fabricated allegations and charges filed against 22 (twenty-two) Oromo nationals. It surprised no one that the TPLF/EPRDF Government, as usual, used the infamous legal tool of the Anti-Terrorism Law, as a result of which thousands of innocent Oromos and other nationals have been victimized, to arrest, detain and take to court another batch of Oromo activists. 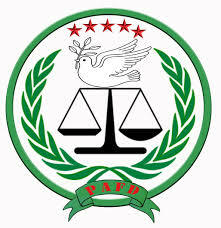 These newest allegations and attempts of abusing the justice system are taking place following the months-long and region-wide public protests in Oromia; and are, undoubtedly, parts of the heavy-handed crackdown, which included the imposition of martial law in the Regional State in an effort to suppress the public anger and demands for change. As described by some international legal analysts, the Ethiopian Anti-Terrorism Law “… criminalizes basic human rights, especially freedom of speech and assembly. The law defines terrorism in an extremely broad and vague way so as to give the government enormous leeway to punish words and acts that would be perfectly legal in a democracy”. This is the reality that came into play in the case of these newly made allegations against 22 Oromo nationals. According to documents obtained by HRLHA, the 22 Oromo nationals, including top political leaders of the opposition Oromo Federalist Congress party, such as Mr. Bekele Gerba (Deputy Chairman) and Mr. DejeneTafa (Deputy Secretary General), Addisu Bulala and others have been charged with allegedly conspiring to overthrow the government by means of instigating a public revolt and protests as well as collaborating with other political organization called Oromo Liberation Front. 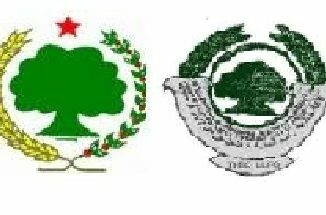 The new creation in this case is that attempts were made to associate the officially registered and legally operating political parties like the OFC with opposition political organizations that were deemed outlaw by the Ethiopian Government in order to criminalize their legitimate existence and activities. It is so unfortunate that Mr. Bekele Gerba is being subjected to such politically and racially motivated injustice and the resultant sufferings in Ethiopian substandard jails for the second time in a matter of two years. The HRLHA has ample documents that hundreds of thousands of innocent Oromos and members of other nationalities have already fallen victims of such injustices and dictatorship committed particularly using this Anti-Terrorism Law, described by some as “a tool to stifle dissent”, as a legal weapon. 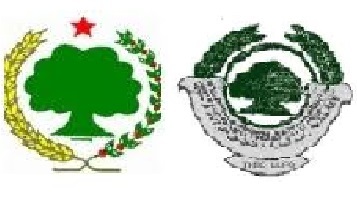 Local, regional and international communities have repeatedly witnessed over the past twenty-five years that the TPLF/EPRDF Government of Ethiopia misuses the political power, the justice system, and other public resources to silence and/or eliminate all forms of oppositions and political descents, despite the constitutionally declared democracy, in order to ensure monopoly and lasting partisan political goals. But, no tangible and effective actions are taken so far to make the Ethiopian Government refrain from punishing its own citizens just for exercising or attempting to exercise some of their basic and constitutionally provided democratic rights. 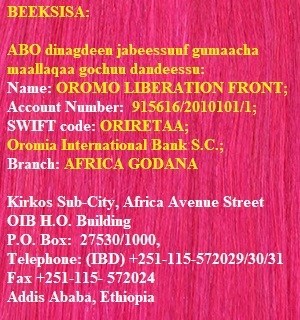 The HRLHA, first of all, calls upon the Ethiopian Government to unconditionally release these Oromo nationals detained and charges for allegedly committing acts of terrorism; as their words and/or acts are undoubtedly legal and, above all, constitutional. HRLHA also calls upon the international community’s so that they condemn the Ethiopian Government, acts of injustices against innocent citizens, and request that these unjustly detained and falsely charged Oromos are freed unconditionally.